*R-Controlled Vowels - Bossy "R" - This packet contains 25 riddle activity pages that reinforce r-controlled vowels. Students will get practice with making inferences as they become "Riddle Detectives" to solve each riddle. Students will write the answer to the riddle (the answer is always a word with a r-controlled vowel) as well as illustrate their answer. Each activity page can be used independently or it can be put together to create a riddle book. A student cover page is included. A Student Reference Page- This page could be used in writing workshop folders or word work folders. It has a picture clue to go with each of the r-controlled vowel sounds. I also use the riddles to reinforce other phonics concepts that we are working on in our first grade classroom such as glued sounds, digraphs, and vowel teams. Students can find and highlight or underline words with these features within the riddles. *Making Words - Make phonics fun for your students by incorporating "Making Words" into your weekly phonics instruction. 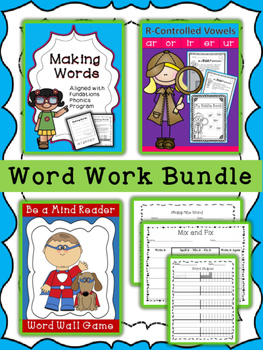 This NO-PREP pack includes 30 "Making Words" activities. Each lesson includes a student sheet along with an lesson plan. Students will simply cut out the word cards located at the bottom of their student sheet to use with each Making Words lesson. Every lesson ends with a "Mystery Word." The mystery word is the last word that the students will make. This word includes every letter on the letter cards. My first graders love the challenge of trying to figure out the mystery word! Depending on the age level, you may give clues to help your students figure out the mystery word. *Be a Mind Reader Word Wall Game - "Be a Mind Reader" is a fun way to reinforce phonics and sight word recognition with virtually no prep time. This game can be used with any words on your word wall or any word list (number words, color words, months, days of the week, shape words, etc). a step-by-step directions page for the teacher, and multiple example game pages to make it easy for you to quickly be able to implement this game as a welcome addition to your phonics and sight word instruction. I use this game as a fun way to wrap up our weekly phonics instruction. You can easily incorporate multiple concepts into this game (glued sounds, digraphs, blends,r-controlled vowels, etc.). If you would rather have the kids use white boards with dry erase markers as opposed to the printable game sheet, that works, too! My kids love this game and beg to play it each week! Enjoy! All of these activities included in this bundle are teacher tested. I use the activities in my first grade classroom! Enjoy!